Most of you probably have heard about DACA (Deferred Action for Childhood Arrivals) that was established by President Obama to allow children who were brought to America by their parents without documents to apply to stay and work in the country. These are young people who have grown up in the U.S., have been educated by our country, and America is the only home they know. This program is now in jeopardy from the Trump administration. So is the Temporary Protected Status Program. Have you ever heard of it? It allows nationals from certain countries to temporarily live and work in the U.S., if they can’t return to their countries of origin due to natural disasters, armed conflict or other extraordinary circumstances. Now it, too, is in jeopardy. Please read the following article from the Migration Policy Institute to understand how tens of thousands will be impacted. Shortly after announcing in September the phaseout of the Deferred Action for Childhood Arrivals (DACA) program, the Trump administration took aim at another form of relief from deportation for certain foreign nationals: Temporary Protected Status (TPS). In quick succession, the Department of Homeland Security (DHS) announced it will end the TPS designation for approximately 65,000 nationals of three countries—Haiti, Nicaragua, and Sudan—throwing their futures into limbo and setting dates certain to sunset their work authorization and protection from deportation. Further, acting Homeland Security Secretary Elaine Duke extended the designation for Honduras by just six months, the shortest period allowed under law, signaling to the 86,000 Honduran TPS holders that their lives may be about to change after nearly two decades in the United States. Taken together, these actions have brought unprecedented attention to the future of TPS, and have unsettled the lives of many foreign nationals with deep roots in U.S. society who have grown used to a sense of stability. As with the DACA rescission, TPS terminations have generated public outcry and a flurry of bills by Members of Congress to protect the affected populations. The clock may now be ticking for 263,000 Salvadorans, the largest TPS group, as they await a January decision on their redesignation. This Policy Beat explores the TPS programs, current countries of designation, and the dozen rescissions of TPS designations over the years, as well as the reasons for not extending those designations. A feature of U.S. immigration law for more than 25 years, TPS allows nationals of certain countries to temporarily live and work lawfully in the United States if DHS determines that they are unable to safely return due to natural disaster, armed conflict, or other extraordinary and temporary circumstances. TPS can be granted for periods of six to 18 months, after which DHS, with the input of the State Department, re-evaluates the designation. If country conditions still threaten the safety of returning nationals, or if the foreign government is unable to handle returns, TPS may be extended. While nationals of some countries receive TPS for two or three years before their designation ends, others, such as Sudanese, Nicaraguans, Hondurans, and Salvadorans, have held TPS for almost two decades, and have established strong community ties in the United States. Currently, ten countries have TPS, with Salvadorans making up 60 percent of the nearly 437,000 TPS recipients (see Table 1). Sources: U.S. Citizenship and Immigration Services, “Temporary Protected Status,” accessed November 19, 2017, available online; Jill Wilson, Temporary Protected Status: Overview and Current Issues (Washington, DC: Congressional Research Service, 2017), available online. Created under the Immigration Act of 1990, TPS grew out of humanitarian and foreign policy rationales. As a humanitarian measure, it aimed to protect people already in the United States who would face strong hardship upon return to their country of origin, but who did not otherwise meet the criteria for refugee status. While the statute does not state that foreign policy concerns should dictate whether a country is designated for TPS, such implications are inescapable in these decisions. For example, granting TPS may insulate struggling countries from the potential for further destabilization that would come with a sudden influx of deportees. Initially, the law aimed to shield Salvadorans who had fled their country’s decade-long civil war. The original statute included an 18-month grant of TPS for Salvadorans, but unlike future TPS grants, the law prohibited a renewal of this one (it was granted anew for different reasons in 2001, and has been renewed since then). The statute placed responsibility for any future determinations on the Attorney General, a role that has since shifted to the Homeland Security Secretary. With prominent lawmakers strongly objecting to country-specific protections, the statute emphasized that TPS would be temporary in nature. To make that intent explicit, the statute requires three-fifths of the Senate to vote to even consider legislation providing permanent or any other legal status to TPS holders. Since 1990, DHS has granted TPS to nationals of 22 countries. Only nationals who are present in the United States at the time of designation are eligible, thus TPS does not cover people who arrive subsequently. In addition, applicants must not have been convicted of serious or multiple crimes, or controlled substance offenses. While TPS grantees can lawfully work in the United States, they are not eligible for most public benefits, as they are not considered to be present in the United States under color of law. At the federal level, they are eligible to participate in the health-care exchanges under the Affordable Care Act, but not for food stamps, Supplemental Security Income, or Temporary Assistance for Needy Families. TPS holders are eligible for Medicaid only in emergencies, though states can choose to extend coverage under Medicaid and the Children’s Health Insurance Program to pregnant women and children with TPS. Further, TPS does not independently offer a pathway to any other legal status, permanent residence, or citizenship. Those who entered the country on a visa can adjust to lawful permanent residence (getting a “green card”) inside the country if they are eligible through family or employment sponsorships. However, the options for those who entered illegally are less clear-cut and depend on where they live in the country, due to a split among federal appeals courts. Normally, noncitizens who arrived unlawfully cannot receive green cards while remaining in the United States. The 11th U.S. Circuit Court of Appeals affirmed this for TPS recipients in 2011, holding that they would need to re-enter lawfully to get a green card. However, the Sixth and Ninth U.S. Circuit Courts of Appeals ruled in 2013 and 2017, respectively, that a TPS grant constitutes admission to the United States, potentially opening a pathway for eligible TPS holders in those jurisdictions to receive green cards without leaving the country. These two court decisions cover people who live in Alaska, Arizona, California, Guam, Hawaii, Idaho, Kentucky, Michigan, Montana, Nevada, the Northern Mariana Islands, Ohio, Oregon, Tennessee, and Washington State. Though President Donald Trump has not spoken about TPS, he has criticized another program with similar quasi-legal status (also known as twilight status)—DACA—as a product of executive overreach. As a result, observers anticipated the termination of at least some country designations. Though the Trump administration has announced the termination of TPS for Sudan, Nicaragua, and Haiti, it has offered beneficiaries more lead time than is typical, ending the designation in November 2018 for Sudan, January 2019 for Nicaragua, and July 2019 for Haiti. Past administrations have rarely given TPS holders more than six months to prepare for termination. Similarly, DHS unexpectedly declined to terminate TPS for Hondurans when that re-evaluation period came up, resulting in an automatic six-month extension until July 2018. The next major deadline comes in January, when DHS must decide whether to end TPS for El Salvador. Despite the widely held perception that TPS has become a perpetual extension of temporary status, 12 countries have lost designation since TPS was established (see Table 2). 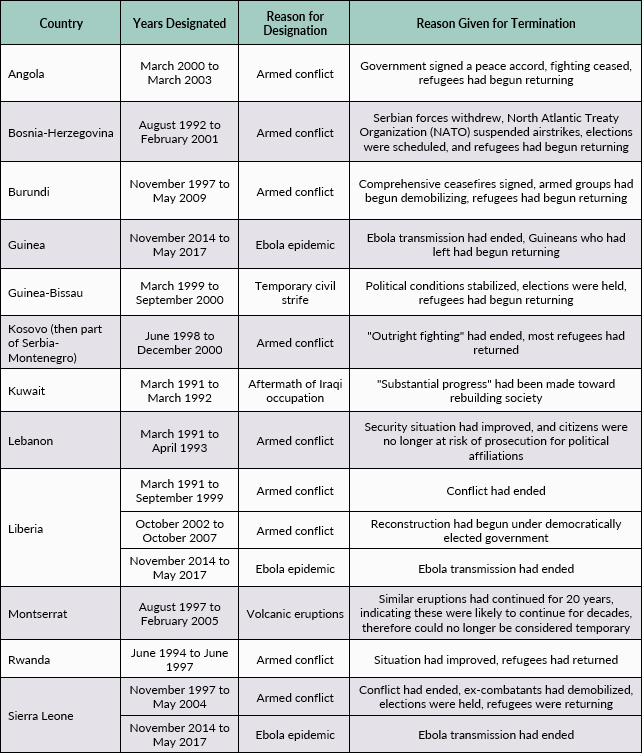 Reasons for termination range from ceasefire agreements signed in civil conflicts, to the scheduling of democratic elections, and in one case, the determination that volcanic eruptions were expected to continue for the foreseeable future and therefore were no longer temporary. Source: Various Federal Register notices, available via Justice Department Executive Office of Immigration Review, “Temporary Protected Status,” accessed November 19, 2017, available online. While TPS terminations overall are not rare, they are for beneficiaries who have lived in the country for prolonged periods of time—groups that happen to constitute the vast majority of current TPS holders. If the administration ends TPS for Hondurans and Salvadorans, in addition to the previous three countries, it will have done so for 95 percent of all current TPS holders. Past administrations, both Democratic and Republican, have opted to extend TPS designations for these populations, but the Trump administration is taking a stricter view of statutory language to justify its terminations. Last year, the Obama administration extended TPS for Sudan due to continued reports of human-rights violations by the government and militias, and because of widespread and unpredictable conflict in Darfur. In contrast, the October 2017 termination notice argues that this conflict is limited to a certain geographic area, and that while human-rights violations continue, they do not prevent all nationals from returning safely. 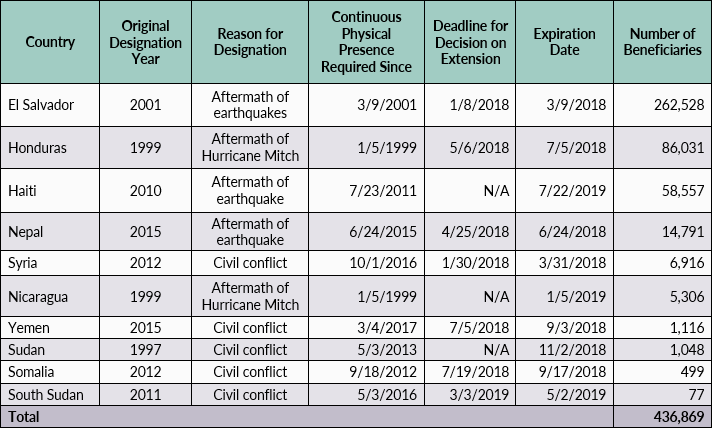 Similarly, the 2016 renewal of TPS for Nicaragua took into consideration not only the devastation caused by the hurricane that led to the initial TPS grant in 1999, but also the compounding effects of subsequent disasters. An extensive explanation of the 2017 termination has not yet been published, but the initial DHS statement suggests that it focused only on whether the conditions caused by the original hurricane still existed, and determined that they did not. As threats to TPS have become more imminent, foreign governments, immigrant-rights advocates, and sympathetic Members of Congress have begun to push to maintain the current protections. Since TPS was created, the governments of designated countries have lobbied the United States to keep the status intact for their nationals. In recent months, Haiti, El Salvador, and Honduras have all advocated for TPS to be extended. In addition to their concerns about the sudden inflow of returning nationals, countries of origin benefit from remittances sent by their nationals in the United States. According to the World Bank, remittances from nationals abroad—including from TPS holders in the United States—account for 17 percent of gross domestic product (GDP) in El Salvador, 18 percent in Honduras, and 29 percent in Haiti, where they often help struggling family members. TPS holders make up 19 percent of Salvadorans in the United States, 14 percent of Hondurans, and 9 percent of Haitians. Lawmakers in Congress have introduced legislation that would provide legal status to TPS recipients. A bill introduced by Rep. Carlos Curbelo (R-FL) would allow TPS recipients from El Salvador, Haiti, Honduras, and Nicaragua to apply for permanent residence, as long as they have not been convicted of certain crimes. Legislation introduced by Rep. Yvette Clarke (D-NY) would create a six-year renewable status for anyone with TPS on January 1, 2017 who has been in the United States for at least five years, and would make TPS beneficiaries eligible for green cards if they can prove they would face extreme hardship if deported. Both bills have bipartisan support. Two Democrats, Rep. Nydia Velazquez of New York and Sen. Chris Van Hollen of Maryland, have introduced much broader bills. The Velazquez bill would allow TPS recipients who have been in the United States for at least three years to apply for a green card, as long as they have not been convicted of any serious crimes. Van Hollen’s bill would allow anyone who has ever held or been eligible for TPS, or is a national of a country that was ever designated for TPS, to apply for a green card, absent certain criminal convictions. These bills will have to meet the requirement for a three-fifths Senate vote to consider legislation giving permanent legal status to TPS holders, and none is likely to move forward anytime soon, given other competing legislative priorities. As TPS holders lose status over the next 18 months, what options do they have? Although the administration has stated it is giving TPS holders time to either prepare travel plans or adjust their immigration status, the latter will likely be difficult for most TPS holders. Most entered the United States illegally, and their options are constrained given the limited legal avenues for changing their status in the United States. A more feasible option is to migrate to a third country, for instance Canada, and seek asylum, as thousands of Haitians and others did in summer 2017. From July through September, Canadian authorities apprehended 11,000 people crossing the border illegally—compared to 2,000 in all of 2016. After DHS announced the termination of TPS for Nicaragua, Canadian Members of Parliament, fearing a new surge, traveled to the United States to discourage Central American and Haitian TPS holders from entering Canada unlawfully. The other two possibilities are to return to their countries of origin, or to remain in the United States. If they choose the latter and are apprehended, their legal proceedings in immigration court will likely drag on for years given the current backlogs. However, even if not apprehended, they would be living in the country unlawfully, in the shadows, with destabilizing effects on certain local labor markets and communities. If TPS holders choose to return to their country of origin, many families, especially those with mixed statuses, would face the prospect of being split. And the receiving countries would have to confront the lack of economic opportunities for returnees, combined with the loss of remittances. As the administration makes these difficult policy decisions, it will increasingly have to come to terms with consequences that extend far beyond the immediate targets. As Court Cases Proceed, Justice Department Continues to Pressure Sanctuary Jurisdictions. On November 15, the Justice Department sent letters to 29 states, counties, and cities, demanding they demonstrate compliance with federal immigration laws. The letters warn the jurisdictions that their laws, practices, or policies may violate Section 1373 of U.S. Code Title 8, a provision of federal law requiring information sharing between local officials and federal immigration authorities, and put them on notice that compliance is a necessary condition for receiving certain Justice Department funding. The letters came after a federal judge in Chicago issued a nationwide preliminary injunction in September that blocked the Justice Department from requiring noncompliant “sanctuary” cities to comply with certain new federal grant requirements. Similarly, a federal judge in San Francisco had permanently blocked the Trump administration from imposing additional funding conditions on unrelated grants. Neither ruling blocked the requirement for compliance with Section 1373, however. On the same day the letters were sent, another federal judge in Pennsylvania issued a similar nationwide injunction to that issued in Chicago, and in addition, found that Philadelphia was in “substantial compliance” with Section 1373. Ninth Circuit Allows Limited Travel Ban to Proceed. The Ninth U.S. Circuit Court of Appeals ruled that the Trump administration may partly move forward with the third iteration of its travel ban. The November 13 ruling allows the administration to bar the entry of nationals from six Muslim-majority countries—Chad, Iran, Libya, Somalia, Syria, and Yemen—as long as those individuals do not have family in the United States or “formal, documented” relationships with U.S. entities. The qualifying family relationships include grandparents, grandchildren, siblings-in-law, aunts, uncles, nieces, nephews, and cousins, closely mirroring those set forth by the Supreme Court in its ruling on the second travel ban. The new ruling partially reverses a lower court decision that blocked the travel ban in its entirety. The case was brought by Hawaii, which argued that President Trump did not have the authority to impose such restrictions on these six countries, though it did not challenge the ban’s restrictions on nationals of North Korea and Venezuela. This case is one of several currently being litigated on the administration’s third travel ban, issued via presidential proclamation on September 24. On December 8, the Fourth U.S. Circuit Court of Appeals will hear an appeal in a case brought by the International Refugee Assistance Project challenging an injunction, identical to the one the Ninth Circuit allowed to go forward, issued by a U.S. district court in Maryland. The Justice Department has asked the Supreme Court to allow the full ban to go into effect while it appeals these two injunctions in the Ninth and Fourth U.S. Circuit Courts of Appeals. Refugees and Resettlement Agencies Sue Trump Administration Over Latest Restrictions. Refugee advocates have filed at least two cases against the Trump administration, challenging a specific restriction in the latest executive order against admitting some family members of refugees. On October 23, the day before the President issued an order resuming the refugee resettlement program, the Departments of State and Homeland Security and the Director of National Intelligence released a memo with recommendations on enhanced vetting for refugees. The policies included indefinitely suspending the admission of some spouses and minor children of refugees already in the country. Refugees and their advocates filed one case against the restriction in a federal court in Seattle, and advocates for Iranian-Americans filed another in a federal court in Washington, DC. Trump Administration Ends Central American Refugee Program. On November 9, the State Department stopped accepting new applications for the Central American Minors (CAM) refugee program. The Obama administration launched the CAM refugee and parole programs in response to the surge in unaccompanied Central American minors arriving at the U.S.-Mexico border in 2014. In an effort to offer protection to children with legitimate refugee claims and to deter them from undertaking the dangerous journey through Mexico, it allowed certain parents lawfully present in the United States to request an in-country refugee resettlement interview for children who were nationals of El Salvador, Guatemala, and Honduras. The Trump administration terminated the parole portion of the CAM program in August 2017. As of August, more than 1,500 children and eligible family members had arrived in the United States as refugees under the program. Another 2,700 had been conditionally granted parole, only to have it revoked prior to traveling to the United States once the program was terminated. USCIS Agrees to Reconsider DACA Renewal Applications Marked as Late. U.S. Citizenship and Immigration Services (USCIS) agreed, after a public outcry, to allow certain Deferred Action for Childhood Arrivals (DACA) recipients to resubmit renewal applications that had initially been rejected by the agency. Nearly 100 DACA renewal applications were rejected because they had been delayed in the mail or had not been retrieved from application lockboxes and failed to make the October 5 deadline. Initially, USCIS maintained that the decisions were final, but on November 15, the agency announced it would allow applicants to resubmit their applications if they could prove they had mailed them in a timely manner. When the Trump administration in September announced the rescission of DACA, it set a deadline of October 5 to receive renewal applications for DACA holders whose work authorization would expire before March 5, 2018. In total, USCIS rejected at least 4,000 renewal applications because they were received after the October 5 deadline, though the policy reversal will affect just the 100 or so that were submitted in a timely manner. President Announces Nominations for Heads of DHS, ICE. President Trump nominated Kirstjen Nielsen to head the Department of Homeland Security (DHS). Nielsen currently serves as White House Deputy Chief of Staff under John Kelly, the former Homeland Security Secretary turned Chief of Staff. Nielsen would be the first DHS head with previous experience working at the agency, where she ran the Office of Legislative Policy and Government Affairs at the Transportation Security Administration from 2002 to 2004. On November 8, lawmakers on the Senate Homeland Security and Governmental Affairs Committee voted 11-4 to approve her nomination. On November 14, President Trump announced his intention to nominate Immigration and Customs Enforcement (ICE) acting Director Thomas Homan to permanently lead the agency. Homan has served at ICE for three decades, including as an immigration officer. Trump appointed Homan as acting ICE director after taking office in January. Border Patrol Detains Young Girl with Cerebral Palsy After Surgery. U.S. Customs and Border Protection (CBP) detained a 10-year-old girl with cerebral palsy after emergency surgery at a children’s hospital in Corpus Christi, Texas. She first came into contact with the agency after the ambulance carrying her to the hospital stopped at one of the Border Patrol checkpoints north of the border. When the agents discovered that she did not have legal status, they followed the ambulance to the hospital, stood guard outside her room, and placed her in immigration custody upon her release. The girl’s detention sparked protests nationwide, and inspired many lawmakers and advocates to call on CBP to let her go. After days of public pressure and a lawsuit filed by the ACLU, she was released from custody. Juries in Washington State Barred from Considering Immigration Status. The Washington State Supreme Court on November 15 approved a rule that makes evidence of someone’s immigration status generally inadmissible in all state criminal and civil courts. Immigration status will be considered only if an attorney can argue there is a compelling reason to do so. The rule takes effect in September 2018 and is believed to be the first rule of its kind nationwide. It emerged as a result of a case that went before two separate juries—the second after the state Supreme Court ordered a retrial. The first jury, which knew that the defendant was in the country illegally, reached a different decision from the jury that did not know about his legal status. New York City Council Approves Legislation Further Limiting Cooperation with ICE. On October 31, the New York City Council passed two bills restricting immigration enforcement actions by city law enforcement officers. One bill prohibits probation officers from honoring ICE detainers—requests to hold suspected unauthorized immigrants until ICE can take custody of them—unless ICE presents a warrant signed by a judge and the noncitizen has been convicted of a violent or serious crime. This policy already applies to the city’s police and corrections departments. The second bill prohibits city law enforcement agencies from entering into 287(g) partnerships with ICE that deputize police officers to serve as immigration officers. Both bills currently await the Mayor’s signature. Anti-“Sanctuary City” Bills Move through State Legislatures. A Florida House committee and a Wisconsin Senate committee have both approved legislation that would ban local governments and agencies from having “sanctuary” policies, which restrict cooperation with federal immigration enforcement agencies. The bills in both states have been introduced and failed in past legislative sessions. So far this year, four states—Georgia, Indiana, Mississippi, and Texas—have passed similar laws.